Located just 50m from the sand of Byron Bay's Main Beach, Bay Motel offers affordable accommodation opposite the Byron Bay Surf Club. Close to a number of local shopping, dining, entertainment and activities, the Bay Motel is also just a short stroll from Belongil Beach, the Byron Bay Golf Course and Arakwal National Park. Located on Byron Bay's main street, Beach Hotel Resort is part of the region's iconic 'pub' and enjoys direct beach access. Surrounded by a number of local shopping and dining options, the resort offers a choice of 25 Poolside, Beach View, Beach Balcony and Loft Suites and a Beachfront Penthouse as well as an excellent range of onsite facilities including a heated outdoor pool and poolside spa. BreakFree Eco Beach offers all the charm you expect from Byron Bay. The resort is suitable for both couples and families and is ideally located within easy access to the main streets and beaches of Byron Bay. Enjoy comfortable accommodation in your choice of either a Studio, 1 Bedroom or 2 Bedroom Suite. Facilities include complimentary secure basement parking, an outdoor pool, internet cafe, BBQ area and tour desk. Situated just a short drive from the airport, Byron Bay Hotel & Apartments offers stylish accommodation in the heart of Byron Bay just 150m from the Main Beach. Surrounded by local shopping, dining, nightlife and attractions, the accommodation offers 43 Standard and Deluxe Studios and 1, 2 and 3 Bedroom Condos as well as a great range of onsite facilities, within walking distance of Arakwal National Park. Located on the pristine sands of Belongil Beach, East on Byron is the ideal accommodation option for those who want to relax in peace and quiet while still enjoying the convenience of shopping, dining and attractions close by. Just a short stroll from the main street of Byron Bay, the resort offers a luxurious range of accommodation and a lagoon-style swimming pool complete with poolside spa. 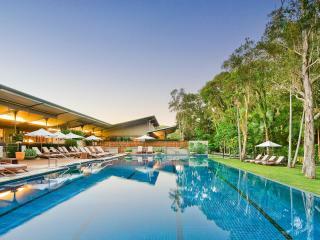 The Byron at Byron Resort and Spa is a luxurious seaside resort set amidst rainforest complete with wooden boardwalks. This unique northern New South Wales resort boasts Standard, Superior and Deluxe Spa Suites only 10 minutes walk from the beautiful Tallow Beach. Enjoy onsite restaurant, daily yoga instruction, day spa, infinity pool and daily shuttle buses to the town centre. Located just minutes from Byron Bay Main Beach, Arakwal National Park, Belongil Beach and the Byron Bay Golf Course, The Lord Byron offers affordable hotel rooms just 2 hours from Brisbane and 30 minutes from Ballina. Enjoying a great range of onsite facilities and a tropical atmosphere, the resort is also close to a range of shopping and dining options. Located on Watego Beach overlooking the Cape Byron Lighthouse, Victoria's at Wategos offers luxurious Tuscan-style bed and breakfast accommodation within minutes of Belongil Beach and the Byron Bay Golf Course. Boasting Standard, Superior and Executive Spa rooms complete with private balconies or terraces, accommodation also offers fireplaces and marble bathrooms with private spa tubs. Offering spacious, 4 star accommodation, Waves Byron Bay is just metres from Main Beach and is centrally located to the most popular shopping, dining, activities and entertainment of Byron Bay. Offering a complimentary range of equipment hire such as beach towels, boogie boards and beach chairs, the resort is close to local swimming, snorkelling, diving and surfing locations including the Julian Rocks Marine Reserve.